Sheikh Ahmed el-Tayeb publicly confirms that Muslim converts to Christianity should be executed, homosexuality is a disease which must be fought and eradicated, and Western values and its brand of “morality” are not compatible with Islam. 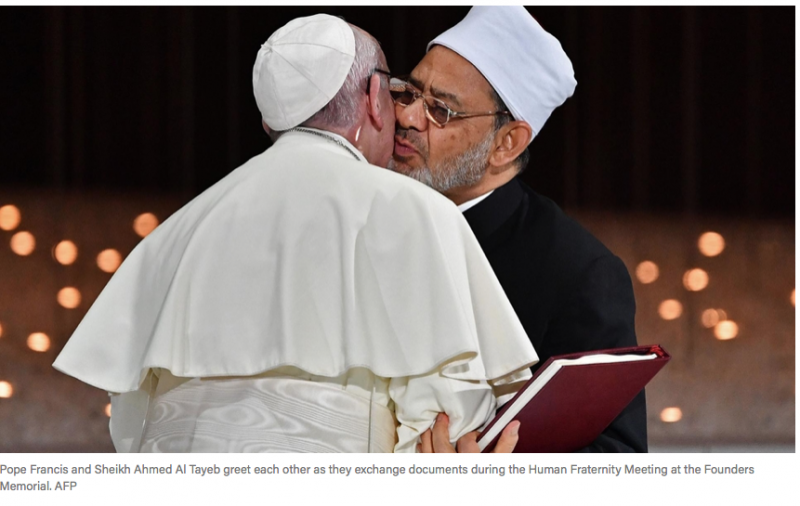 The National (h/t GatewayPundit) Pope Francis’ visit to the Middle East included the signing of an historic ‘Human Fraternity’ agreement with Sunni Islam’s highest authority, Sheikh Ahmed el-Tayeb. Pope Francis and Dr Ahmed Al Tayeb walked either side of Sheikh Mohammed bin Rashid, hand in hand as they arrived at the Founder’s Memorial in darkness and to peaceful music. The signing of a “Human Fraternity Document” at the Founder’s Memorial, is seen as a historic moment in relations between the Al Azhar and the Vatican. It is to be a declaration of “good and honest intentions” and a “guideline for future generations,” a video describing the document said. Popes have always had an inherent hatred of Jews. Looks like this one has joined a fellow rabid Jew hater. The bumbling fool doesn’t seem to realise that muzzies hate Catholics (and all Christians, for that matter) second only to Jews. This gives new meaning to the term kissing as_. Shame on the pope for not standing up for the truth about the chaos and the mayhem of islam. No wonder so many catholics are leaving what has become a cult of evil under this pope. This pope is looking to get himself killed. And then the next crusade begins. Catholics BEWARE! The Pope is a TRAITOR to CHRISTIANS and to the HOLY ONE, our Majestic Creator. For the first time in Vatican history, the pope allowed for the reading of Islamic prayers and Koran readings from the Catholic facility. The readings and prayer came as Pope Francis met with Israeli President Shimon Peres and Palestinian Authority President Mahmoud Abbas in Vatican City, a gathering designed to pray for Middle Eastern peace. Linda Jesus warned us in the Olivet Discourse when he talked about Satan’s ministers who say “I am the Messiah” and deceive many. That fits the Catholic Church just like the shoe fits on Cinderella’s foot. Catholics, BEWARE of your FALSE PROPHET POPE! Don’t let the FALSE PROPHET lead you into HELL ! But what is different today is that Pope Francis is speaking error (or at least scandalous ambiguities) almost every week. The magnitude is stunning, both in quantity and quality. Quantitatively, Pope Francis speaks so frequently against the Bible and Tradition that even traditional websites have stopped making lists…. I guess another crusade not likely. Man how cool if while embracing, kissing, washing the unclean feet of Muslim beasts,: a long sharp sword appeared. Instant art for spiked vatican fence. So, the Pope has graduated from boys to men. Great comment Ian. You are absolutely correct. Also Catholics and muslims sided with Hitler in WW2. And they also were on the same side in Yugoslavia civil war. Catholics and Muslims have a lot in common. They both hate secularism and divide of church and state. Both are political systems. The Dope has submitted to Islam. His “peace” is costing Christian lives, taken by Muslums. He obviously does not care about Christian victims of Islam. Pick up the even more grotesque pic of them kissing (almost tonguing) at jihadwatch. Disgusting. Jon, Just looked at the pic. Gross. If that’s what they do in public, what do they do in private??? Thew look like two koala bears! The Pope’s appeasement towards radical Muslims is downright disgusting. Not saying that his predecessor Benedict was perfect on all accounts but this would not have happened under him. Hart, I believe that Benedict was fired for his truthful remarks about violent Islam. Don’t you all get it the RC church has been a fraud since it’s inception. Even as a kid in catholic school none of it seemed right. The crap that was covered up not just little boys but girls, married women. The booze.the way women were second class. They didn’t even speak up when the holocaust was killing Jews and Christians. Just look at the coverup still going on in Texas alone. The Pope may not have spoken up, but hundreds of priests & nuns were killed for doing so. It is the devil that wants to destroy the Catholic Church. When a large tree falls the noise is loud …but no sound is heard from ALL those growing straight and true. Similarly, in the Church, the evil is loud and deafening while the good goes mainly unnoticed and humble.